Travelling along Belfast’s Outer Ring Road through the the Newtownbreda area one passes signs for Belvoir Park. The picture above, dating from 1805 and painted by Vice Admiral Lord Mark Kerr, shows a house of that name. Today the name is almost all that remains of what was once the largest private residence in this part of the country. An keen amateur watercolourist of some ability Lord Mark, the third son of the 5th Marquess of Lothian, enjoyed a successful career in the Royal Navy until 1805. His connection with Ireland came through marriage in 1799 to Lady Charlotte McDonnell who would later become Countess of Antrim in her own right. 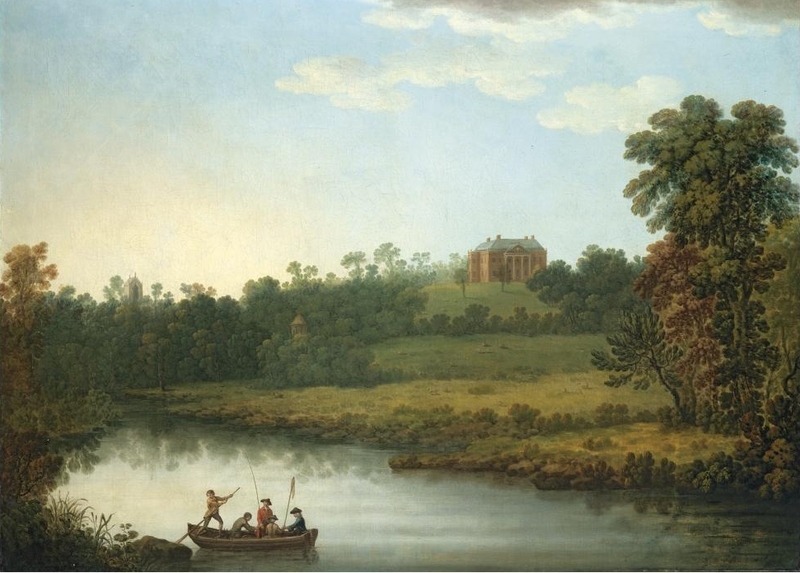 During the early 1800s the Kerrs stayed at Belvoir Park, which belonged to Lady Charlotte’s half-brother and it was during this period that Lord Mark painted this picture along with another, both of which were in the collection of the Knight of Glin until sold at Christie’s in 2009. There are earlier, and finer, views of Belvoir Park, the first of which is shown immediately above. This is one of four oils painted by the artist Jonathan Fisher (fl. 1763 – d. 1809) at the request of the house’s then-owner Arthur Hill-Trevor, 1st Viscount Dungannon. 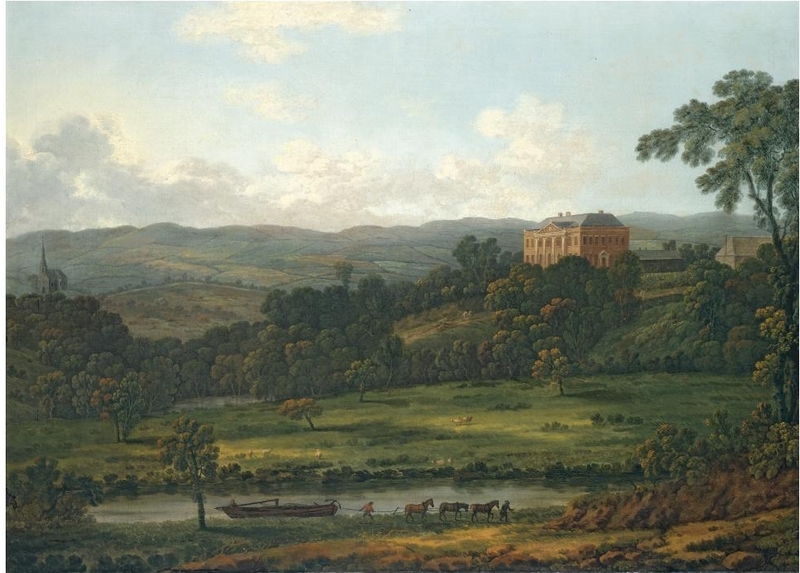 Fisher is believed to have been born in the 1740s and to have spent some time in England, first coming to attention here in 1763 when he was awarded a premium for a landscape by the Dublin Society (he would receive another five years later). 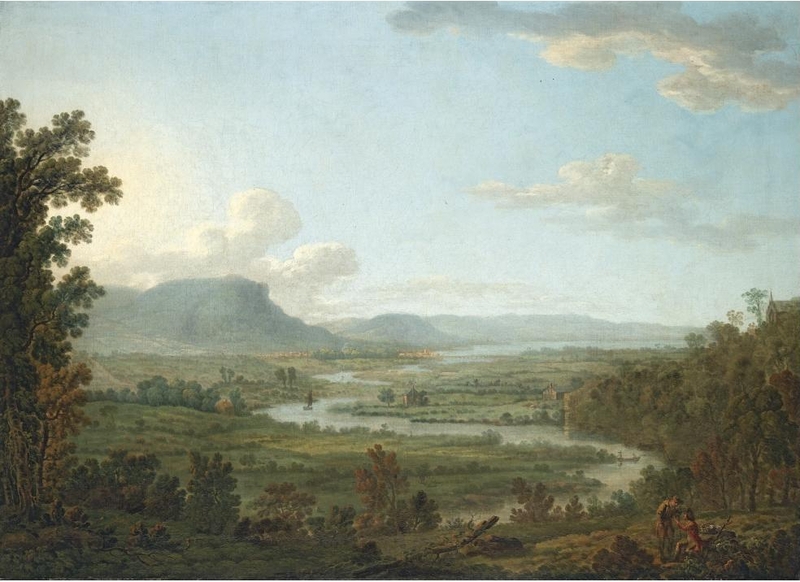 He exhibited some 57 pictures with the Society of Artists in Ireland between 1765 and 1780, including the four views of Belvoir which were shown in the organisation’s premises on South William Street, Dublin (now the headquarters of the Irish Georgian Society, see Restoration Drama, July 15th). The pictures are highly significant because they show us the house from different aspects when it was newly completed and before alterations were made towards the close of the 18th century. 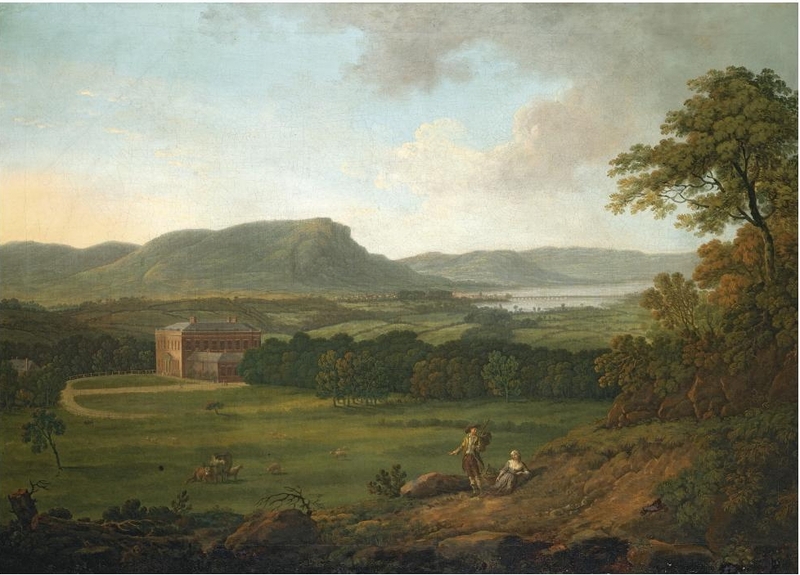 They also offer us views of the landscape around Belfast before the city had much expanded and show how lovely this region looked prior to the onset of the industrial revolution (the last of the pictures at the end of this post offers Fisher’s bucolic view of the area as it would have been seen from the house). Sir Moyses Hill was the first member of his family to settle in Ireland in the 1570s and it was his descendant Michael Hill who purchased for £2,000 the land on which stood Belvoir, then called Ballyenaghan, although the family’s main estate was at Hillsborough. Michael Hill’s wife Anne Trevor, subsequently married to Viscount Midleton, is reputed to have given the place its new name, in part owing to the view (‘Belle Vue’) and in part in recollection of Belvoir Castle, the Duke of Rutland’s seat in England where she had spent a large part of her childhood. Thanks to Lady Midleton, the property was inherited by her younger son Arthur who in 1766 was created Viscount Dungannon. Faced in brick, Belvoir Park’s main elevation looked north with views over the Lagan river and thence to the mountains beyond. This front was of seven bays, the three centre ones incorporating immense Ionic pilasters beneath a pediment with carved wooden mouldings. The entrance front faced west while the south side featured a canted bow. Belvoir Park is often attributed to Richard Castle, although if this were so it would have been a very late work since he died in 1751. He certainly designed the nearby Knockbreda Church for Lady Midleton (it can be seen to the left of the house in the first of Fisher’s pictures above). More recently the proposal has been made that a lesser known architect Christopher Myers was responsible for Belvoir Park. Following the first Lord Dungannon’s death in 1771, title and property alike passed to a young grandson (his only son having predeceased him by a year). The second viscount appears to have lived and entertained lavishly and as a result further work was undertaken on the house, notably by the addition of a third attic storey which can be seen in Lord Mark Kerr’s watercolour. 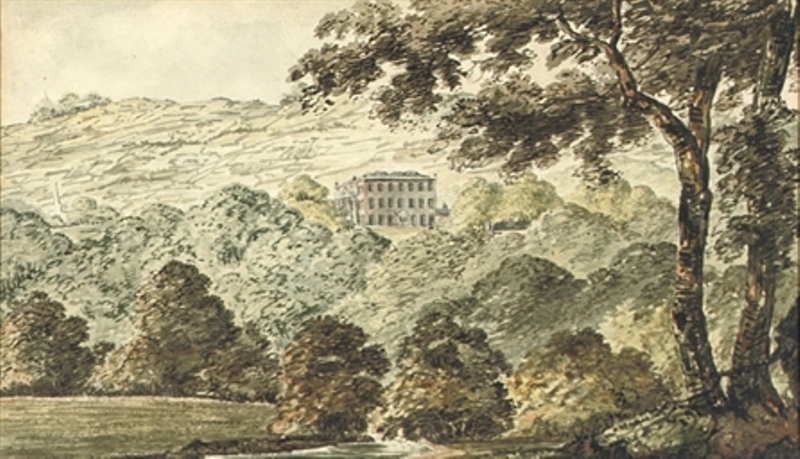 In the mid-1790s Lord Dungannon moved to his Welsh estate and Belvoir Park was left unoccupied except by the agent, and by the Kerrs for a period. Eventually the entire place was sold in 1809 and after passing through various hands was acquired in 1818 by Belfast banker and landowner Robert Bateson around the time he became a baronet. He did much to improve the Belvoir, as did his son Sir Thomas Bateson (later first Lord Deramore) who around 1865 commissioned Newry architect William Barre to carry out some alterations to the house, including balustrades around the roof parapet and a balustraded entrance porch. At that stage the estate ran to more than 6,000 acres but decline set in soon after Lord Deramore’s death in 1890. 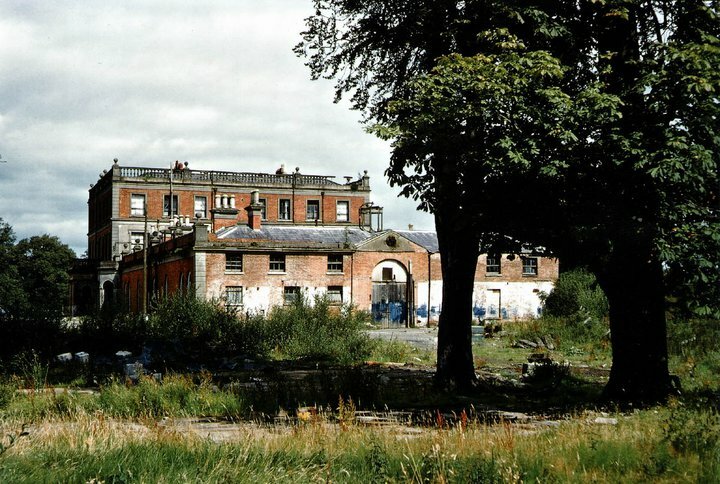 Belvoir was let to various tenants but by this time Belfast was fast expanding and the land on which house and grounds stood just a few miles from the city centre was wanted for housing. 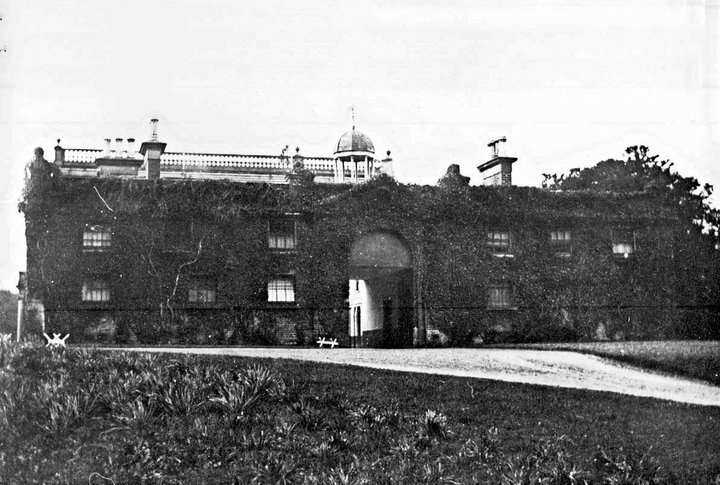 In the 1920s part of the estate became a golf course while it was suggested the house become a residence for the Governor of Northern Ireland (ironically the Hill family’s former principle property, Hillsborough Castle, was instead selected). 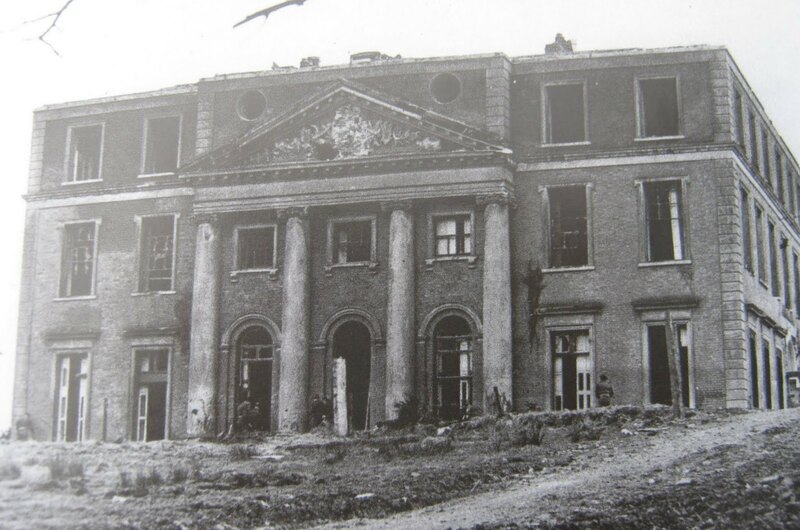 During the Second World War the site was used by the Admiralty, but from 1950 onwards the buildings started to fall into ruin. 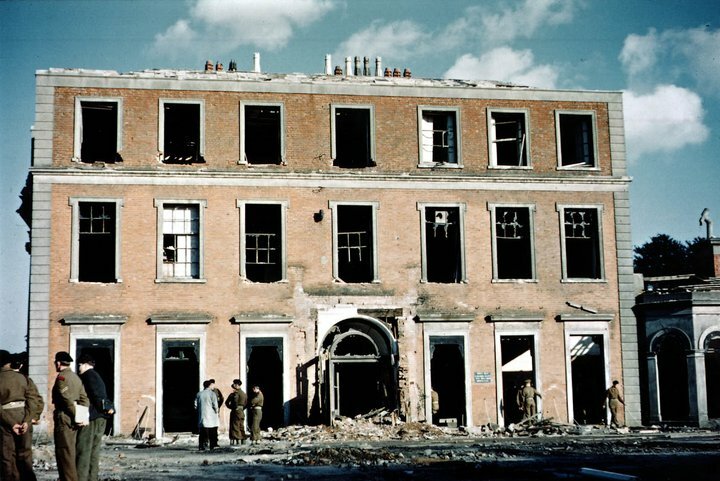 The succession of photographs seen here show the building in 1961 shortly before it was blown up by members of the army; today only parts of the old yard remain. 185 acres of the former estate are a forest park but the rest of the land is given over to suburban housing. The loss of Belvoir Park must be judged a grievous one but thankfully the paintings of Jonathan Fisher survive as evidence of this once-fine house. Privately owned, the pictures have been loaned for inclusion in an exhibition on Irish landscape art currently running at the Ulster Museum in Belfast. This entry was posted in Architectural History, Country House, Down, Heritage at Risk and tagged Architectural History, Belvoir Park, County Down, Georgian Architecture, Heritage at Risk, Irish Country House, Stately Home, The Big House. I have said this before, your blog is beautifully written and very interesting. Sadly, so many of your posts are obituaries recording the sad demise of so many fine buildings. Very true, but these obituaries serve as a valuable reminder of what and how much we have lost, making what we have left all the more precious and worthy of preservation. Great article; wonderful images and narrative. Tim. Many thanks Tim, your praise much appreciated.